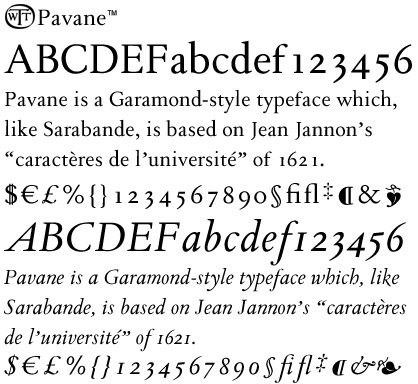 TWT Pavane is a Garamond-style serif typeface based (like Sarabande) on Jean Jannon’s Caractères de l’université of 1621. But while Sarabande reproduces the original faithfully, TWT Pavane has been adapted to more modern usesuch as a somewhat increased x-height. Still, the ascenders and descenders remain more in keeping with the French Renaissance look than in most modern (so-called) Garamonds. TWT Pavane has two styles: a roman and a true italic. US$49.